Vacation in luxury at this Marina Residences 2-bedroom/2-bath condominium. Located on the top floor (5th), with views of the Marina and Sierra Madre Mountains from the balcony. Located in the heart of Nuevo Vallarta, Mexico, the Marina Residences Condominiums has its own private pool, to enjoy quiet afternoons lazing in the sun, or enjoy Barbecue cooking under the large poolside palapa, or a game of bocce or practice your putting on the private putting green. With every modern convenience home cooking is fun and easy. I have just updated my condo with New mattresses, bedding & fresh paint. The Sofa, dining chairs have all been updated and recovered & new drapery, completed for 2018. For 2019 I have new stainless kitchen appliances-Fridge/Freezer-Stove & Oven - Dishwasher. My air conditioning unit was completely rebuilt so I have quiet, really fresh air. Plus a new 48 inch curved Smart TV for the living room and new smart TV for the master bedroom. Plus new screen doors. My condo is truly beautiful and comfortable and set for long or short term rental. Social Club Membership is available with rental of my condominium - very few Marina Residences have this membership available. For a fee of $15.00 USD plus taxes per person-per week. This allows guests full access to the Paradise Village tm “Beach Club” located just a 10 minute walk from my door Plus the Sports Complex & Gym and reduced rates at El Tigre golf course. For more information just email me. Paradise Shopping Centre located just across the lane-way makes shopping for groceries, clothing, souvenirs and access bank, internet cafes, medical centre, money exchange, as well as deli & many restaurants easy. Phone service for local calls and incoming long distance and wireless internet are all included. We now have a small Casino Opened in Nuevo Vallarta. Master bedroom has a king size bed with on-suite bathroom and Jacuzzi tub., new Smart TV. Second bedroom has 2 double beds with full bathroom down the hall, & small older TV. Wireless Internet Access is available in my condo and poolside, complete kitchen, washer and dryer, air conditioning and ceiling fans, Cable TV in living room cable with vcr/dvd video library. Your stay is sure to be memorable, convenient, and relaxing. 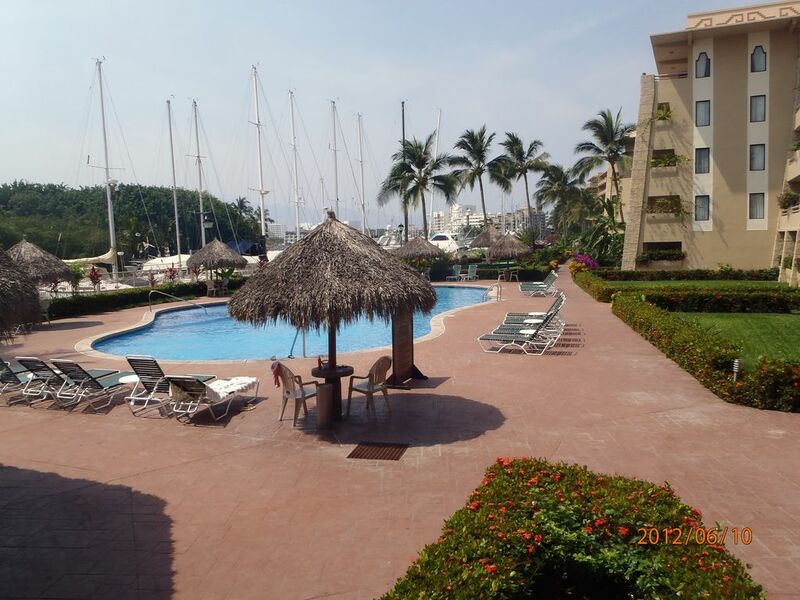 The Paradise Village Yacht Club & Marina are just steps away for easy access and pick up for fishing trips, water taxi, and many of the Vallarta Adventure tours. There are so many restaurants and many other activities just minutes away come and make this your home for a week or month! Inquire for long term rental rates! There are several fun beach clubs/restaurants and beach accesses in the area for you to explore and enjoy. Golfers can enjoy a reduced rate at Paradise Village El Tigre golf course, and make sure to check out the world class Spa while you are there. Or book Sunday Brunch a the Golf Course. There is shuttle service to El Tigre, & the Sport Complex. Take a Free Shuttle Bus tour of Nuevo Vallarta, this shuttle service runs every 20 minutes and does a round trip of all of Nuevo Vallarta with hop on and off service. Looks like a train! Bus transportation is fast, cheap and convenient with city buses running from the shopping centre every 10 minutes to Puerto Vallarta or north towards Bucerias. Take the water taxi from the marina to down town Puerto Vallarta to enjoy restaurants, night-life or stroll the Malecon. There is so much to do and so much to experience I am sure you will never want to leave this Paradise. Have the Vacation of Your Dreams in my Beautiful Marina Residences Condominium!! Keywords: Paradise Village, Nayarit, Riviera, Golf, Fishing, Beach, Condominium, rental, hotel, resort, cheap, discount,apartment, nuevo, puerto, vallarta, beach, marina,ocean, holiday, fishing, quiet, shopping, golf, gym,spa, surf, kids, children, retirement, Casino, gaming, blackjack. My husband and I have 3 children. They were young teens when we purchased our condominium and they are now all in their 20's. We all love the sun and beach. We enjoy our condo so much and wish we could spend more time living in our tropical paradise. We love holidays in Mexico and decided that Nuevo Vallarta was one of the nicest beaches and areas we had found. The convenience to Paradise Village Shopping Centre, groceries, Sports Complex & Beach Club, ensure we have a wonderful , relaxing time each and every time we are at our condo. Private pool, with Barbecue area and full outdoor kitchen. Bocce courts, and putting green. My transferable Social Membership enables beach access at Paradise Village Beach Club & GYM /Sport Complex & Golf Discounts -only a short walk away and the user fee of $15.00USD per perosn is well worth the price with all the amenities that are offered. Master Bath has Jacuzzi tub. 2nd full Bathroom has shower, also washer and dryer. Sierra Madre Mountains surround us. Maid Service for sheets and towels. Transferable Social Membership $15. per person per month. Inquire. Many pantry items are there, just replace what is used up. microwave, dishwasher, tap water is purified and drinkable. Beautiful dining area indoor and patio. Lots of nice dishware and serving items. Library book exchange in the lobby. Sand toys are in the laundry area. Marina Residences have beautiful gardens and garden pathways. Over looking the Marina , has table and chairs and loungers. Our time in this condo was amazing. The location is second to none. The facility is clean and well taken care of, it is quiet and has an amazing view overlooking the marina. Dorice was very responsive and went above and beyond to make our stay enjoyable. I am so happy to hear you had a wonderful holiday at the Marina Residences. We enjoy our calm, relaxing marina view when we are at our condo as well. Thank you for staying at my condo and I hope you return next year. Loved our stay at the Marina Residence. The unit was very clean, spacious and very well equipped. The location was awesome with easy access to the beach and Paradise Village in general. Having access to the beach club and sports/golf facilities was an extra benefit. Dorice was very easy to work with and went out of her way to ensure we had a most enjoyable stay. We would definitely recommend and return to this location. I am so glad you enjoyed your stay at the Marina Residences! It was a pleasure having you stay Mimmo, I hope you return next year to the Marina Residences. Clean and tidy. Great location! We had a lovely vacation staying at this condo. Very clean and fully equipped for convenience to make meals at the place. Would recommended it! Thank you for writing your review. I am really happy to hear you had a relaxing vacation. I hope you will return soon. Our 2 bedroom condo had everything we needed to make our stay perfect. It was clean, spacious and perfectly decorated. Bedrooms were big along with the beautiful deck was awesome! Would highly recommend! Thank you for your review. It is wonderful to hear you enjoyed our Marina Residences condo as much as we do. I look forward to having your family return. This is a very comfortable condo. I love how the owners leave spices and condiments for use by the guests. Makes life so much easier when you are just looking for a dash of cinnamon not to have to buy a full one. Having said that, I leave behind things I acquired. Front desk staff very helpful. We enjoyed Il Pescatore more than once. A completely enjoyable vacation. I am so happy you found my Marina Residences condominium comfortable. I sure hope you return soon. The property is beautiful and has everything you could want! Loved it. I am so happy you had a wonderful holiday week & enjoyed our Marina Residences condominium as much as we do. I hope you return very soon. Please inquire for final rental rate. Prices vary by number of guests and time of year. Month = 28 days or 4 weeks Inquire for monthly rates. Christmas is a 2 week minimum booking and rates are slightly higher. Weekly maid service is mandatory $30.00 per week.